This site has been created for picture researchers, editors and other media professionals... anyone, in fact, looking for classic images of France. All of our images have been shot specifically for travel, tourism and editorial use, capturing the real spirit of France today. We also hold others more suitable for reference and research purposes. Just ask. We can carry out a free picture search and respond to your enquiries without delay. Alternatively, if you like what you see but require something which we don’t yet hold in stock, we’re happy to undertake commissions, shooting to your subject lists. This site has been created for editors, picture researchers and other media professionals ...anyone in fact, looking for classical images of France. All have been shot specifically for tourism, travel and editorial use and capture the spirit and atmosphere of France today. All of the images have been taken by Roger Moss, a respected photographer and writer who lives in France and has devoted over 25 years to producing images and illustrated features for travel media. Whether driving, walking, cycling or skiing, he has a determination to get to new locations and to return with something very special. 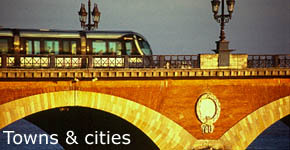 well-known destinations, our particular strength is in illustrating the spirit of deepest France. We will do our best to help you with your picture requirements, and with our specialist knowledge of France, can assist in other ways. We may be able to help you with research, and can undertake commissioned location shoots throughout France. We can also produce editorial or promotional text, plus complete illustrated features. © SARL Roger Moss 2008. All original material on this website is the property of SARL Roger Moss unless otherwised stated. All images contained on this website and all images provided for preview by the PictureFrance image library belong to Roger Moss and are subject to copyright. Please read the terms and conditions for permission details.